There's nothing like curling up next to the fire on a cool evening. All of us at Consumer Survey have searched far and wide for a durable, affordable, long lasting fire pit. The 32" Alhambra Fire Pit with Cover will add style and warmth to your back yard making it the perfect patio accent for barbecues and dinner parties. This outdoor fire pit comes with robust corner posts with ladder design to provided additional support. 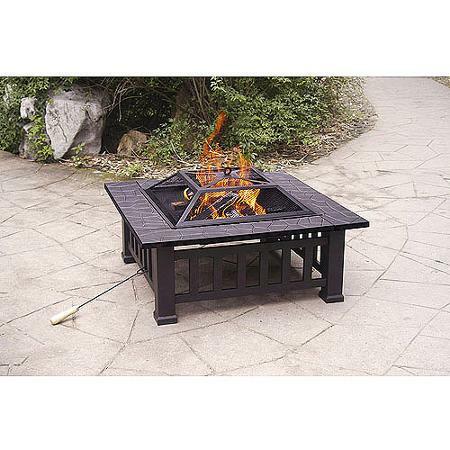 The backyard fire pit features a portable, square design measuring about 32". This outdoor fire pit comes with a faux-stone finish that adds stylish touches, and more importantly, keeps you warm. With a rust-resistant finish, the Alhambra Fire Pit offers a durable performance and the craftman-style pit is very easy to assemble. The cover of the fire pit is coated with durable PVC to withstand UV rays and cold weather conditions while the safety mesh screen lid keeps you and your loved ones safe from burns or accidents. The first thing that drew us to this particular fire pit was its looks. It not only adds warmth to family get-togethers but it also is the perfect accent for any patio. This pit has a faux-stone finish which adds to its stylish touches that really pulls the look of it together. It also of course does a great job of keeping you warm while you are outside during the cool evenings, so it definitely does what it's made for. We've had experiences with other pits that just don't exude enough warmth so that everyone sitting around them can feel warmed. The rust-resistant finish was an added bonus to this product ensuring that consumers don't need to spend more money or time on a rust resistant paint to coat it with.